Adult incontinence, excessive perspiration or child bedwetting and Potty Training. 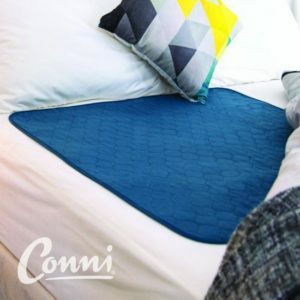 Waterproof Absorbent Conni Mate Bed Pads. Soft stay-dry top layer, highly absorbent slim core, breathable PUL waterproof backing and is extremely light weight. Simply place the bedwetting pad on top of the bottom sheet, colored side up; and lay directly on the bed pad. The user will feel most comfortable when wearing underpants or light clothing (from the waist down) as heavy clothing may feel wet. Visit the clinic to purchase or ask questions about any merchandise. © 2019 Pelican Health Clinic.